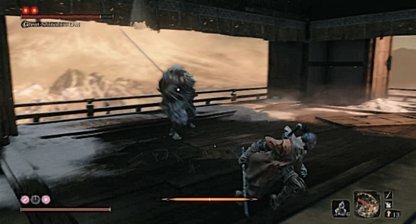 Check out this Sekiro: Shadows Die Twice guide and walkthrough from Ashina Dungeon to the fight vs. Great Shinobi - Owl after acquiring both Shelter Stone & Lotus of The Palace. 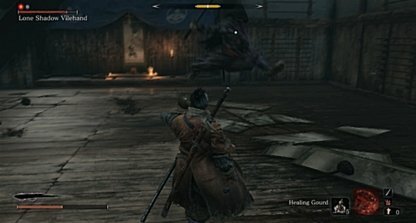 This includes boss fight tips, techniques, tricks & more! Continue swimming until you reach a dead end, then swim up to the surface. Grapple up until you reach a tree with an item. 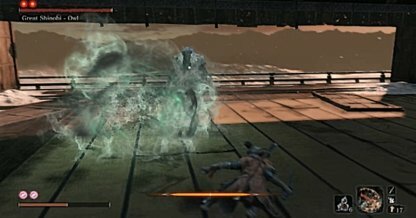 (*)Lone Shadow Vilehand is a skippable mini boss. 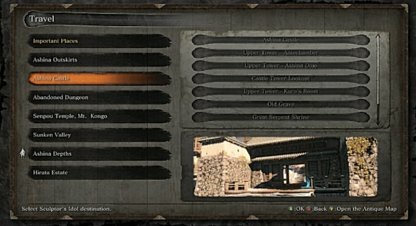 At this point of the story, Shinobis have attacked the Ashina Castle, and most idols except the Abandoned Dungeon have been locked. 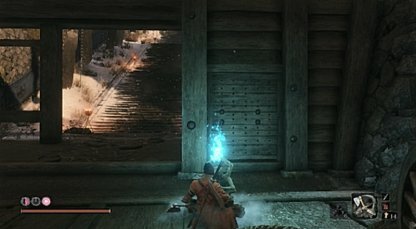 You'll have to make your way to the Ashina Dojo from here. Make sure to commune with the idols that have been locked to reactivate them. 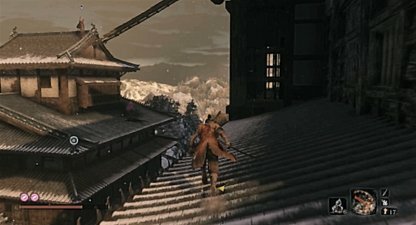 Along the way, there will be ladders and paths the Shinobis laid out to easily reach the Castle Lookout. 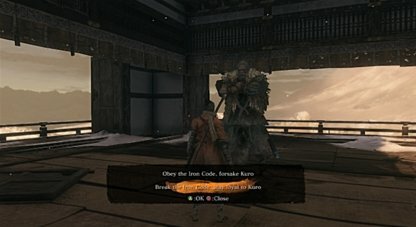 You can use this to reach Owl faster and skip the Lone Shadow Vilehand fight, however, it's recommended to activate first the idol at the Ante Chamber and Ashina Dojo. 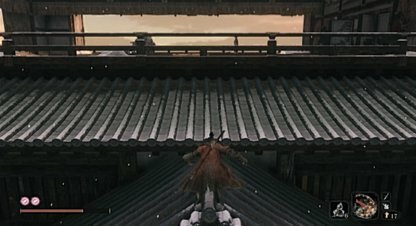 Upon activation of the idol in the ante chamber, you can come back out towards the rooftops and head up straight to Owl. This choice will impact which ending you trigger. The first will lead to the Shura ending, and the 2nd will progress the story further. 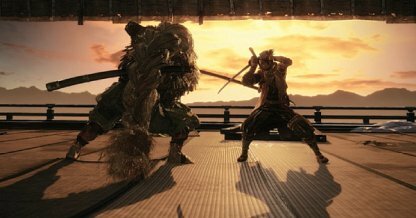 His moveset is pretty much the same as Lone Shadow Longswordsman, focusing on quick strikes and kicks. 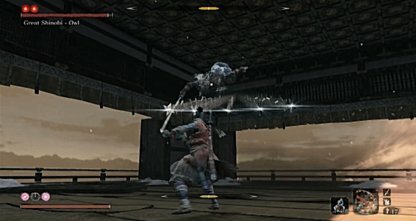 Parry his moves to deal posture damage. 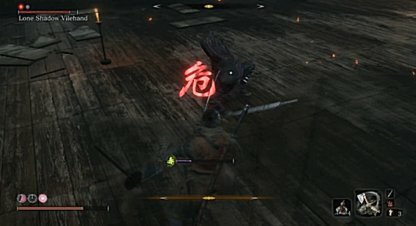 His main difference from the other Lone Shadow boss is that he has a lunging poison attack. 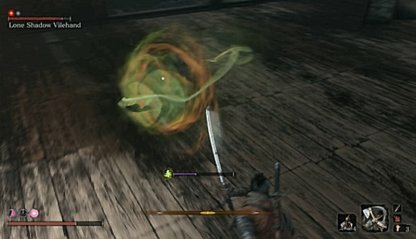 Step dodge these attacks instead of parrying as this can afflict you with poison even if guarded. He lunges straight at you to strike with his poison daggers. 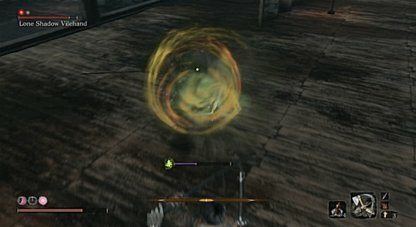 Step dodge these attacks since parrying will increase your poison gauge. He lowers his body and charges in for a sweeping kick. Jump to avoid this attack. A quick two-slash combo. 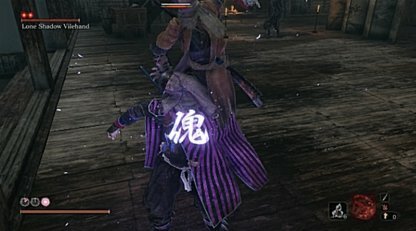 Parry this to deal posture damage. He spins up for a spinning kick. 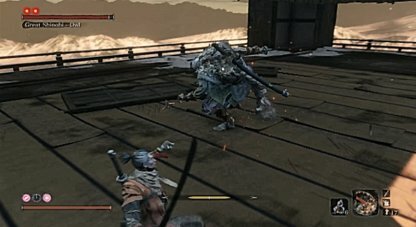 Parry to deal posture damage. He jumps up and slams down to you with a kick. 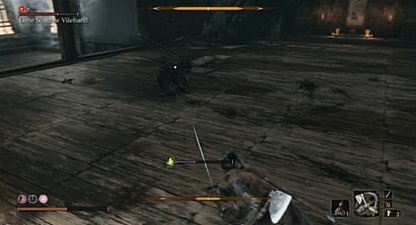 Parry to deal posture damage. 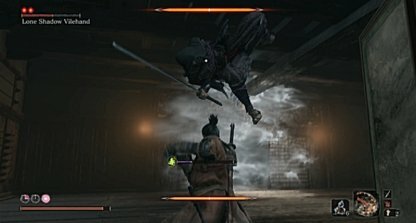 He jumps up and does a flying kick towards you. 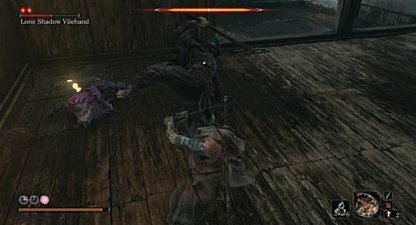 Parry to deal posture damage. He pulls back his sword and rushes in for a quick slash attack. His moves are powerful but recover slow, especially his shuriken to slam attack. 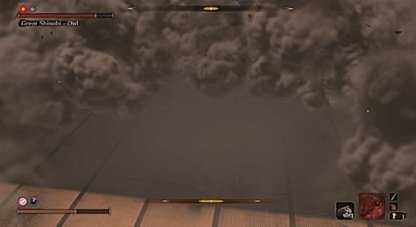 Use this window to do some quick damage on him. He will occasionally use the same tricks you have, such as fire crackers and shurikens. He also has smoke bombs. When you first fight him and reach the second phase, he will plea for mercy. Ignore as he will throw a smoke bomb for a cheap shot. He throws a green ball at close range to disable your healing items. Avoid this by jumping or dodging backwards. He throws two shurikens at you and jumps to the air for a slam attack. 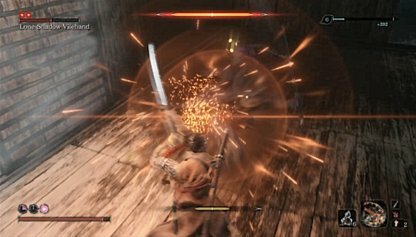 Parry the shurikens and step dodge to the right since parrying the slam will deal great posture damage to you if not properly timed. He jumps on your sword to propel him back and then throws a fan of shurikens at you. 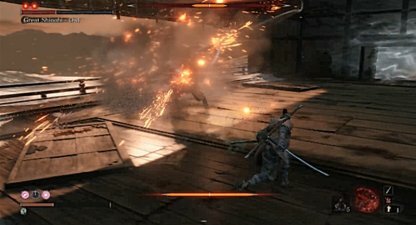 Deflect and parry this move. He throws a quick shuriken at you then quickly charges in for a strong slash attack. 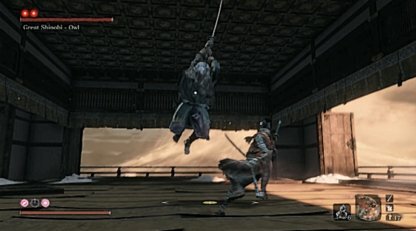 Parry this move or jump to avoid posture damage. This can knock you back if deflected. 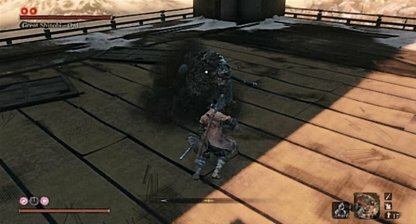 A slow two slash combo which can be parried. A slow single slash attack. 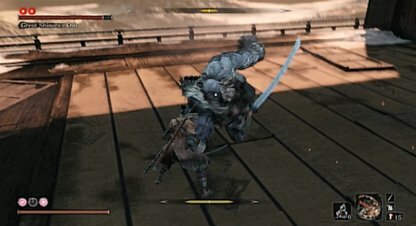 Parry this attack. Uses firecrackers to stun you. 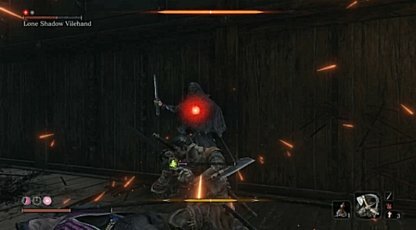 Dodge back to avoid getting stunned. On the second phase, he will occasionally throw smokebombs when you're close. 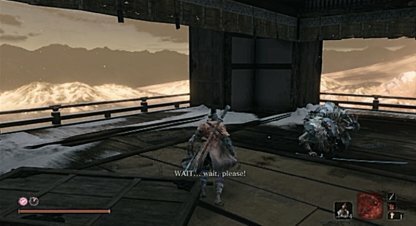 Prepare to parry, don't run backwards since you will lose your lock and your back will be facing him directly, leaving you vulnerable to his slash. 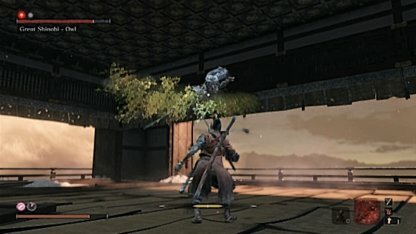 On the second phase, instead of throwing shuriken after jumping on your sword, he will throw poison on the floor. Avoid the move by dodging back, and avoid the affected area as it can still deal poison damage.